When pulling negative G-forces, inverted and with weapons systems hot, the last thing a fighter pilot needs is an unfriendly watch. The Omega Spacemaster Z-33 is heir to the throne of the original Flightmaster and provides an ease of use that adapts to the most challenging circumstances. Unlike the interlude with the accomplished X-33 (you really have to see this X-33 article), the Z-33 returns to its roots, but also adds some no-nonsense functionality that makes it brilliant. With the Z-33, you will never see a cadre of clones adorning the wrists of hipsters, nor will you see anything like it on the tarmac. I have never worn a watch that was so polarizing; people either loved it or hated it, sometimes to the extreme. These reactions were visceral, and I expect might be for the reader as well. Do you like it? Well that is all that matters, and such an independent spirit is likely a prerequisite. The Z-33 is also a quartz watch, and though I prefer mechanical, to say it nicely, I enjoyed the functionality quartz made possible. 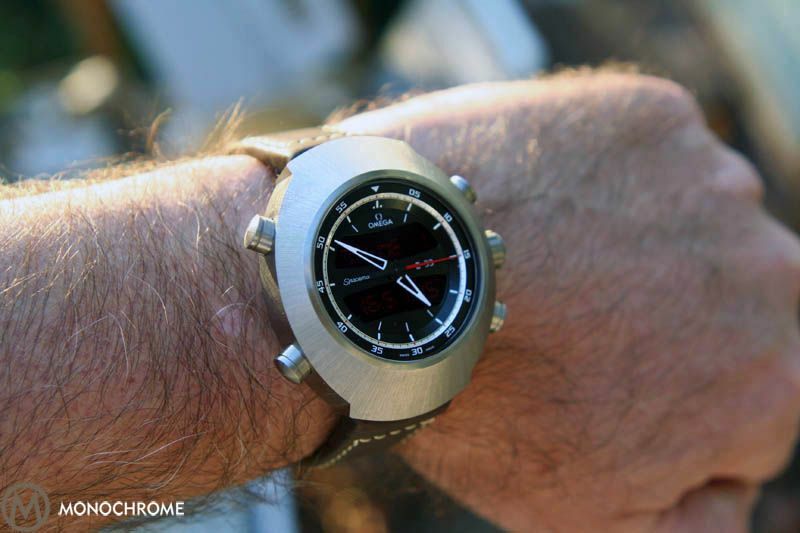 Love it or hate it, the Omega Z-33 deserves respect. One look at the Z-33 and its Flightmaster heritage is immediately apparent (see Flightmaster article). Both cases sport the identical space-age shape; the crown and button configurations mirror one another; and the dials are obviously close cousins. The differences are under the hood, but from an aesthetic standpoint, the similarities explain the Z-33’s distinctive style. Despite the hard angles and edges, the watch is free of sharp points. 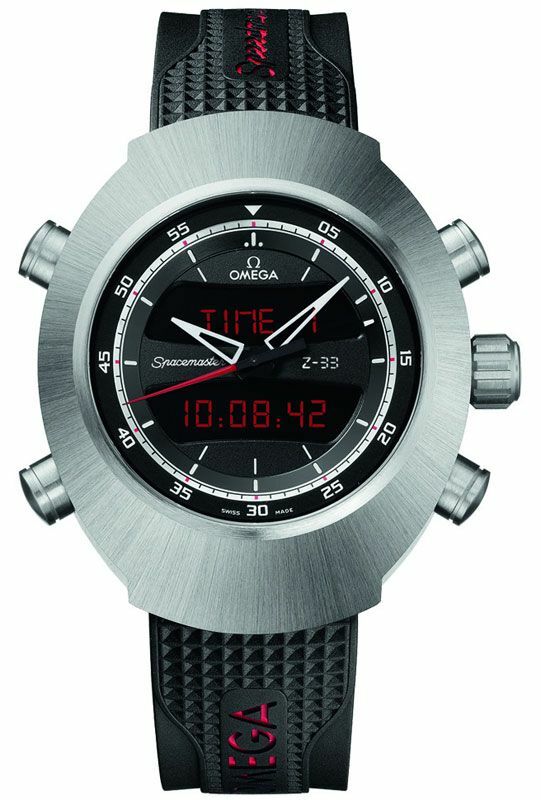 The Spacemaster Z-33 is a member of the Speedmaster family. 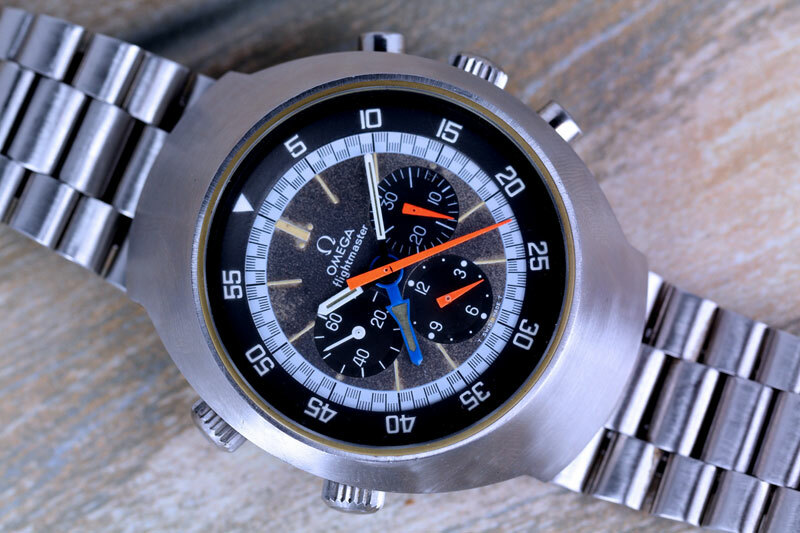 Given that the Speedmaster genre’s nickname is “the Moon Watch”, made famous by Neil Armstrong’s wearing his Speedmaster in space, maybe a Speedmaster that looks like it belongs on the moon is appropriate for the repertoire and aptly named Spacemaster. 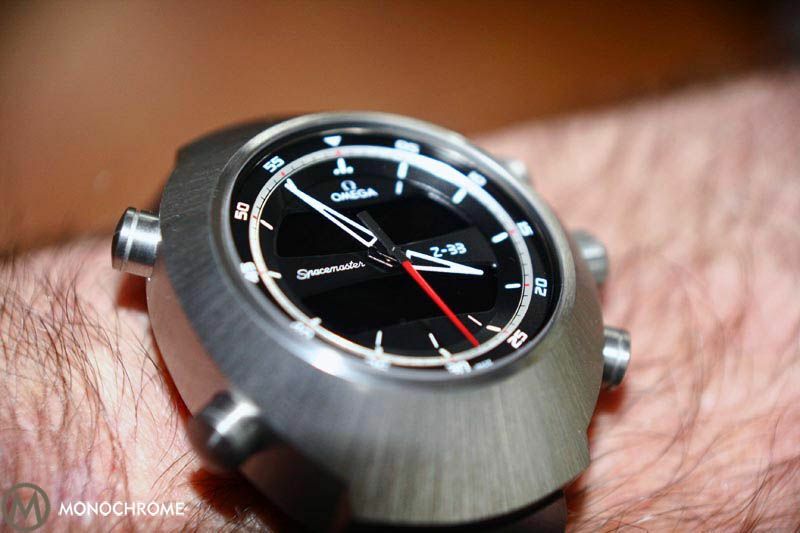 Titanium is a welcomed upgrade, and the Z-33’s brushed, grade 5 titanium case is breath taking. The minimalist sunburst pattern makes an elegant statement, and given the 43mm size, the weight reducing titanium makes the Z-33 seem a blithe companion; that is until you glance at your wrist and see the colossus. Though you will never forget the Z-33’s presence, its light weight keeps your arm from turning into an anchor. Just be careful around the doorframes. The watch’s size aids its flight computer functionality, but this blessing might also be its bane. In the confines of a cockpit with a pilot reaching for flight maps and controls, this watch is going to take a pounding. Not to worry: the Z-33 is up to the task. The only lasting concern is for a Helo (USN) or helicopter pilot’s operation of the collective pitch control on the left side of the seat, which will press the watch into tight quarters. In an aircraft, this watch will snag and bump, but it will equally continue to look gorgeous. It might even survive a nuclear blast or looks like it could; hyperbole aside, this is a tough watch. You gotta love a watch that has enough complexity that Omega has issued an iPad app to learn all the features. The app simulates handling of the physical watch, and I highly recommend a download (here) for a test flight regardless of purchase. Even the sharp clicks on the buttons are reproduced virtually, and I easily switched from real-world watch to virtual watch throughout the review period. A tour of the buttons/crown, starting with the top left and moving counter-clockwise, reveals the most ready features. The top-left button is the favorites button and allows the user to store his two favorite functions. Since my flying was restricted to a desk chair, I chose the chronograph and date. Instead of clicking here and turning there, all it took was one button, and I had what I needed. The ability to customize one button with the two features most important to you simplifies getting important information. My favorite button feature is the ability to push the lower left button to clear the analog hands from obstructing the red LED display while simultaneously lighting the LED. When pushed, this button moves the two hands to rest at 3 or 9 o’clock, allowing an uninhibited view of the digital screens. 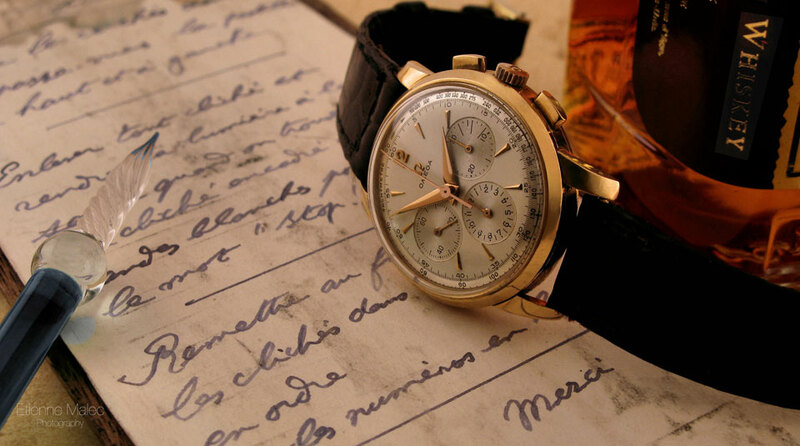 Need a quick view of the chronograph? One button provides the information. 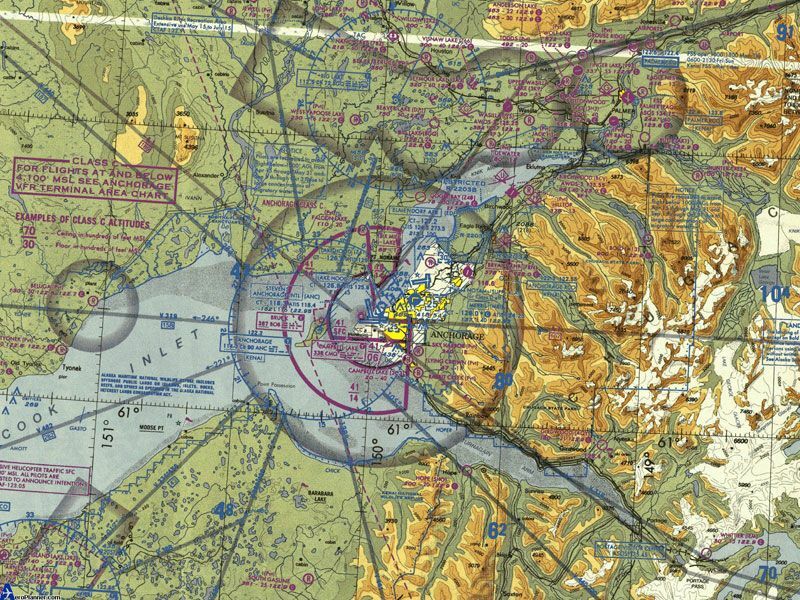 While flying, no pilot wants to look in, through and over the analog hands. The one push button is a simple, yet outstanding feature. Push this button twice, and you begin to record a flight time. 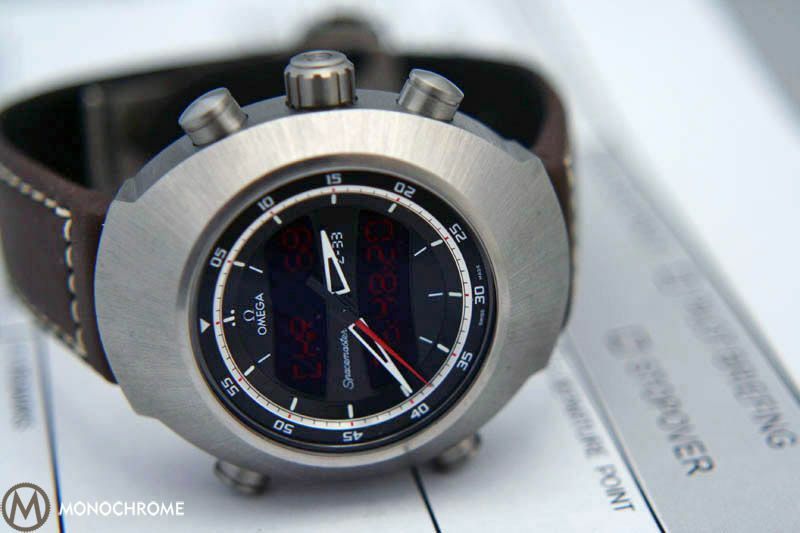 Moving to the right side of the case puts us in familiar chronograph territory – lower right button to clear the register, and upper right button for stop/start. The upper right button doubles as an input for setting various functions. The crown turns or clicks, but I found clicking the easiest option, which will cycle through the various functions: time 1 (local), time 2, and UTC, 12 or 24 hour display, date, perpetual calendar with annual weeks and days, flight computer, chronograph, and countdown timer. 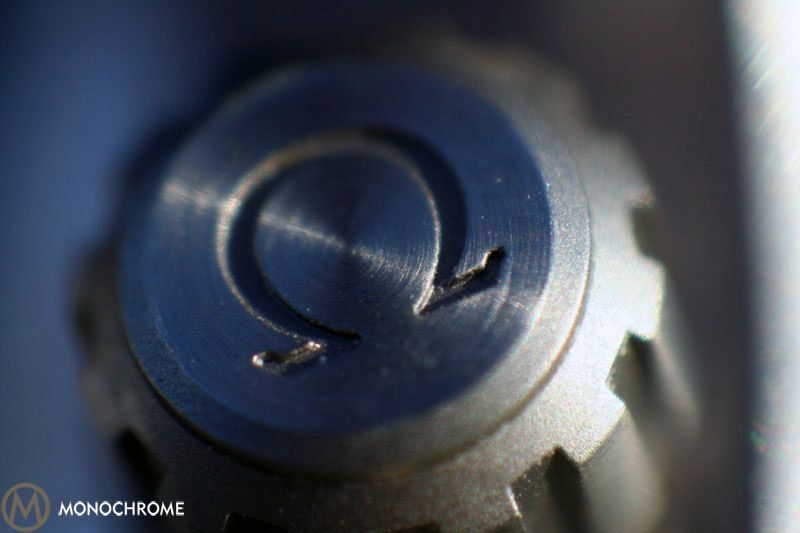 The crown, engraved with the Omega symbol, also pulls out when setting various functions. A useful option is the energy saving mode that puts the watch to sleep, preserving battery power. Given the variety of all of these tasks, four buttons around the case comes in handy. The flight computer distinguishes this watch as the ultimate pilot’s tool, allowing the pilot to record and store up to ten flight logs in two different modes. These logs allow for block-to-block times, meaning the aggregate time from removal of the blocks, through the taxi, flight, return taxi and finally to the replacement of the blocks. In addition, it alternatively calculates flight-time-alone, meaning time in the air. If you choose block-to-block, a long delay beside the runway for continuous wake turbulence makes for a greater overall time, but the flight time interval is accessible (BO FLT). Choosing flight-time-alone mode only records the short flight time out of the City to East Hampton (FL FLT). The skeleton, delta hands are a legible white against the black dial. The red/black/white overall color scheme has a racy feel and looks attractive. 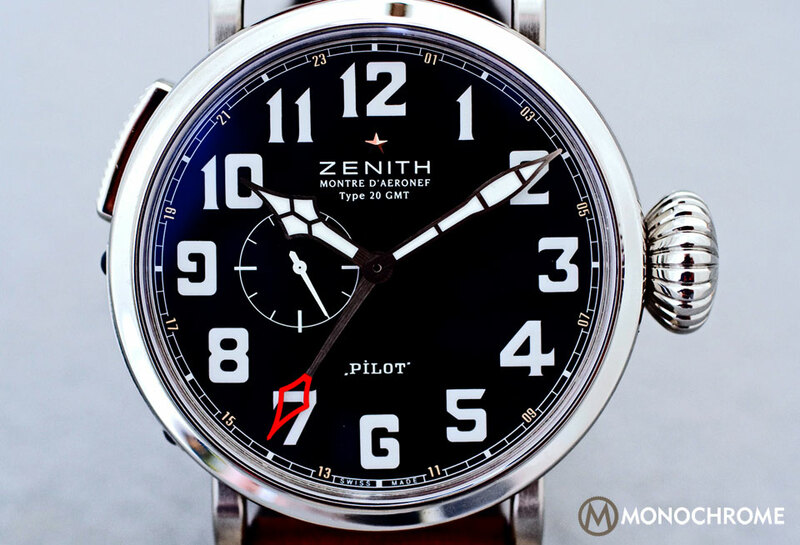 As a pilot watch, both for the original Flightmaster and now the Z-33, I would have expected the upper triangle to be on the dial between the two dots and pointing upward to the dash relocated on the chapter ring. As is, the design works fine, but I expect a dive watch’s triangle to point downward, and a pilot watch’s triangle to point upward. A bit picky, but call it a purist expectation. Because the two LED screens provide information, the dial is less cluttered than the original Flightmaster. The inner silver ring with its red markers every five seconds/minutes pairs well with the red second hand and creates a helpful contrast for visibility. The seconds hand reaches across the dial and stops precisely on the red markers. The terraced dial provides a 3-D effect with a cascade from the chapter ring to the face, and the white hash marks follow downward in waterfall fashion. The double-sided anti-reflective sapphire crystal preserves a pristine gaze at the dial. I could read the LED in bright sunlight, but it was easiest to read with lower light. The crystal has a thin lip protruding above the case. We mentioned the immediate appeal of the brushed titanium case, but turn the watch over and against the relief of brushed titanium pops a polished Speedmaster logo. Stupendous! The logo sits high atop the alarm’s resonance chamber with the chamber’s sound slots located along its sides. This chamber amplifies the alarm’s sound, achieving air raid volume. There are two choices of strap, rubber with the company logo or brown leather with white stitching; my test-watch had the leather strap. 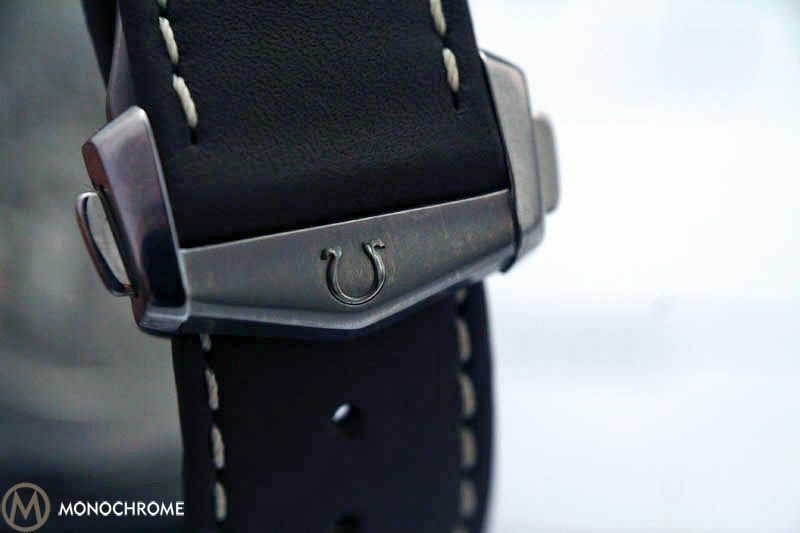 The strap was supple, soft and handsome, attaching to the case via internal lugs. The fold-over clasp is a superior design as it keeps the leather against the skin and is faster for put-on and take-off. The new thermo-compensated quartz calibre 5666 makes the magic happen, providing the go-to functionality and dependable accuracy. 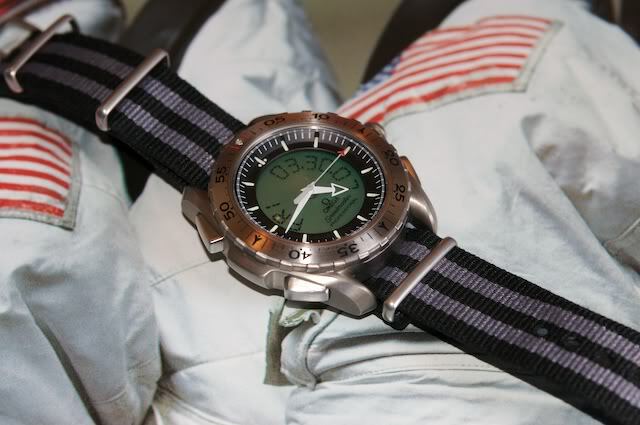 This movement derives from the X-33, a watch developed in the 70s for space flight, specifically a flight to Mars. 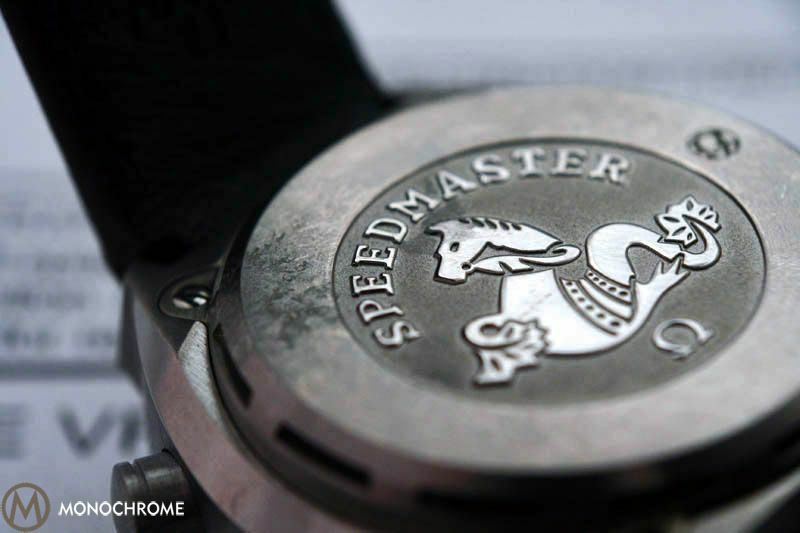 On the dial, the logo reads Spacemaster instead of Speedmaster. If the movement can withstand the rigors of space and those extreme temperature differentials, it will handle any terrestrial environment. Bring it on; the Z-33 is ready. If, for the sake of accuracy, I were to purchase a quartz watch, this might be the one, but the real question is whether pilots will buy it. For pilot or enthusiast, it all depends on “love it” or “hate it”. What about you? The price: for 1/5 of the roughly $6000 price, you can get a Hamilton (a Swatch brand) Flight Timer, which also has a flight log. 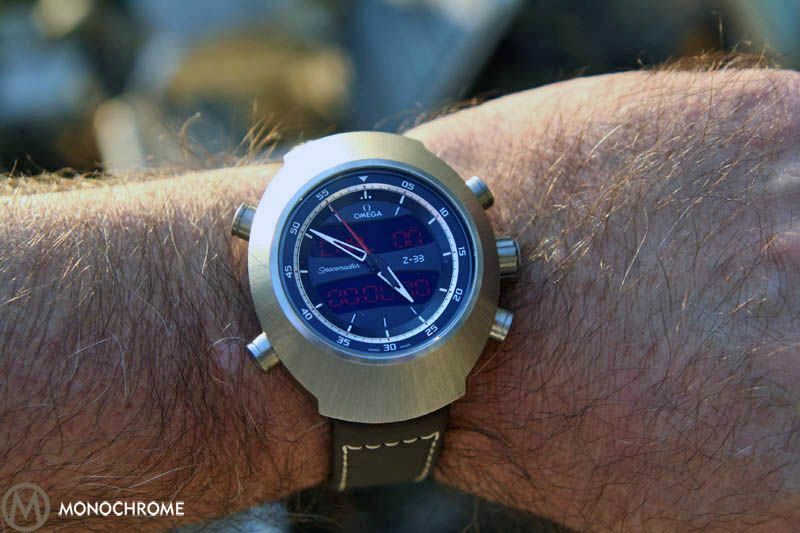 The Z-33 seems overpriced; it is, after all, a quartz watch, but you are literally paying for out-of-this-world durability. The watch sits very high on the wrist (19.85mm), due to the alarm’s echo chamber. Without the echo chamber, the watch sits with a lower profile and a more ergonomic fit. It is a toss-up because then again, you give up the loud alarm. Multiple button push. In trying to operate the right side buttons, I would place my thumb on the left side of the case, which resulted in accidental button push on the left side. Training my thumb to place itself “just so’ prevented the problem, but required intentionality. Digital display could have been more bright to improve readability in bright sun light. I want a thicker, beefier veal strap commensurate with the watch’s pilot classification. 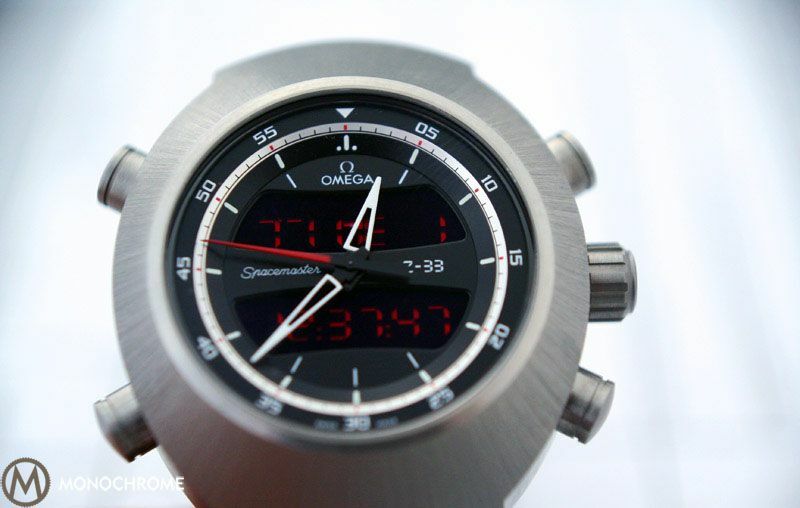 Here’s a link to the Spacemaster on the Omega website, with some nice additional photos. Se puede activar la alarma activada o desactivada. Hay un modo silencioso. 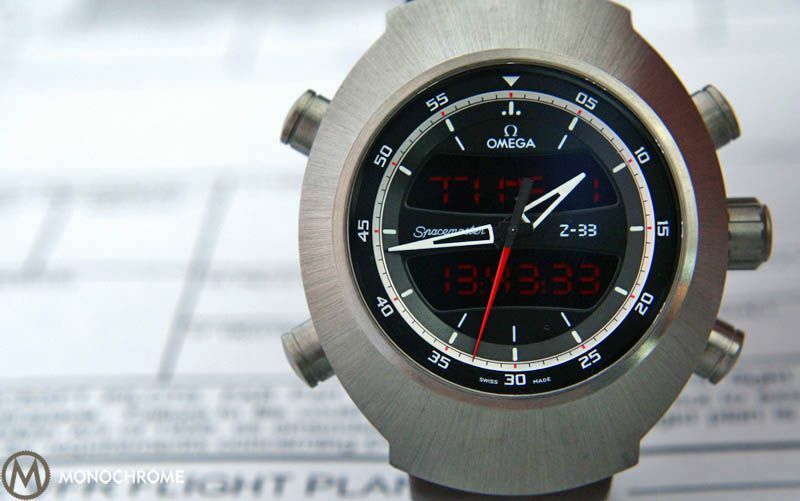 Please check the Omega website for more detailed 5666 specs, K.
the original Flightmasters were and still are unbeatable. 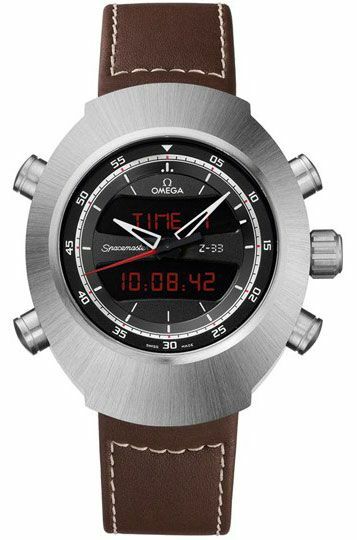 Omega seems to have messed with that heritage, I mean, quartz, at an astronomical price, really? Hopefully in seven years they will release a 50th year model with all that ws good about the old model and romance of a mechanical motor. I’d rather go out and buy a Swatch! You write, “Without the echo chamber, the watch sits with a lower profile”. Is the echo chamber removable? Hi Stefan – no, the echo chamber is part of the case. Thanks Max. The wording suggested to me that it _was_ removable. Thanks for your review! I want to get this watch, but have to wait for the right date, next year I think. 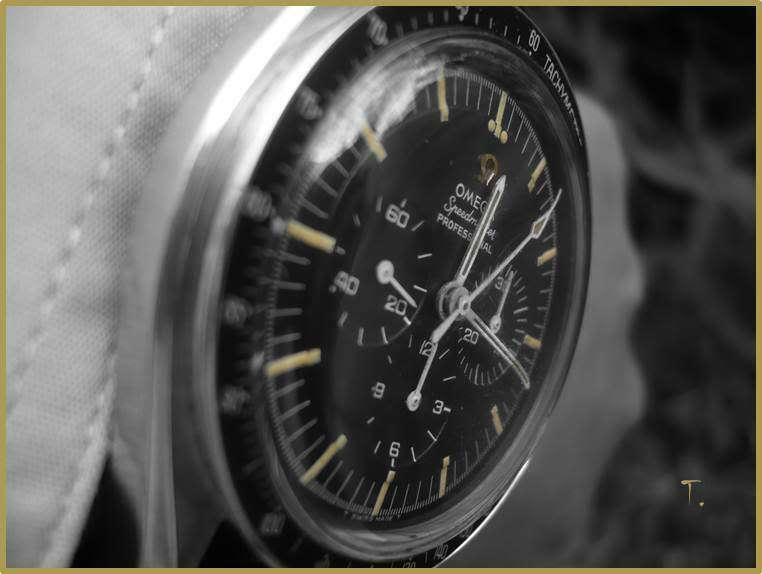 I´ve noticed that € 4,360.- here in Vienna, Austria, is a lot less than many other Omega watches – a great blessing for me! In Switzerland I know a shop where I think I can get it much cheaper. This is top secret :-)! Wish me luck!